Quick Any2Ico can take high quality icon or image files from a binary executable or resource file (.exe or .dll). Icons can be exported to a variety of formats with available sizing options. The program can also be used to add or remove image formats from icon files. How to extract: Download Quick_Any2Ico.exe to a folder of your choice and launch. Very nice, I am able to make icons with this app when IcoFX2 is unable.Quick Any2Ico has a small footprint & is fast and reliable along with being very user friendly. Greenfish Icon Editor Pro is a tool for creating icons, animated or static cursors and other small images. Can extract icons and cursors from executable files and icon libraries, batch convert image files to icons or other image formats and supports advanced selection handling (marquee, lasso and wand tools, saving/loading selections from files). Offers various gradient styles for filling shapes, and includes many filters such as remove matte, drop shadow, inner/outer glow and bevel etc. The program opens and saves in ICO, CUR, ANI, PNG, XPM, BMP, JPEG, WebP and TGA formats and creates icons and cursors up to 256x256 @ 32-bit, which can also be PNG-compressed for use in Vista and above. Include Greenfish Image Converter (for processing TIFF and SVG files), which requires .NET Framework 3.5. A 64-bit version is available (within the folder). Alternatively, a PortableApps version is also available: Greenfish Icon Editor Pro Portable. How to extract: Download the "portable version" ZIP package and extract to a folder of your choice. Launch gfie32.exe or gfie64.exe (for 64-bit OS). Optionally, delete unnecessary language files. Contrast adjustment in Exposure dialog. Improved: RGB Formulae (alpha adjustment, new operations). WARNING: this no longer comes as a direct download of the zip, but as an executable downloader which downloads the zip, but in the process you have to decline installation of about four different annoyanceware toolbars and addons. Also the downloader itself is not portable; it leaves folders in AppData. When you click the download link, a page opens with the download, just un-check the "Use our download manager and get recommended downloads" box. You'll get the zip file that you want. My Avast keeps blocking the site/file so I just disabled. After download I checked using VirusTotal and comes up clean. RealWorld Cursor Editor can create and edit cursors, both static and animated. You can draw your cursors pixel by pixel or make them from images using a simple wizard. 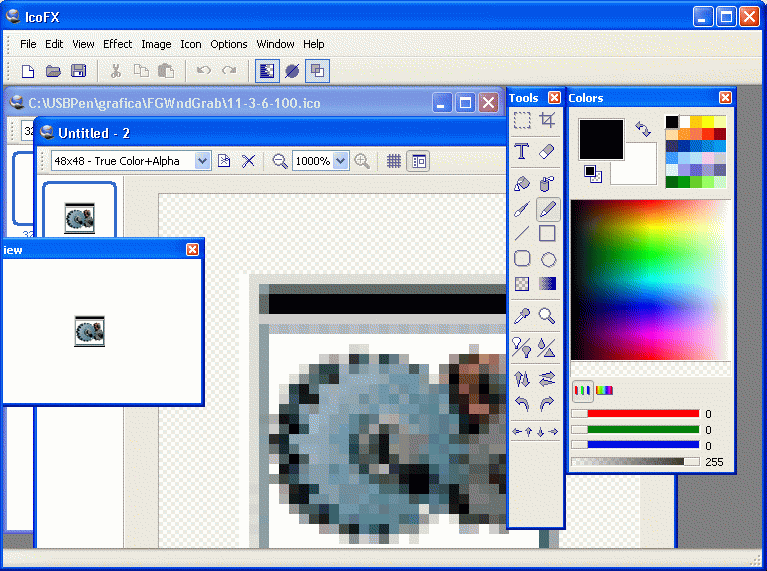 Images in cursors can be modified by drawing tools such as Lines, Curves, Rectangles, or Ellipses. A drag-and-drop based interface allows users to easily reorder, duplicate, or append frames to animated cursors. The program contains several predefined filters covering color corrections, softening, sharpening, motion blur and other effects. Selected filters (for example drop shadow) can be applied on multiple images at once. Can import cursors from Linux XCursor format. How to extract: Download the ZIP package and extract to a folder of your choice. Launch RWCursorEditor.exe. 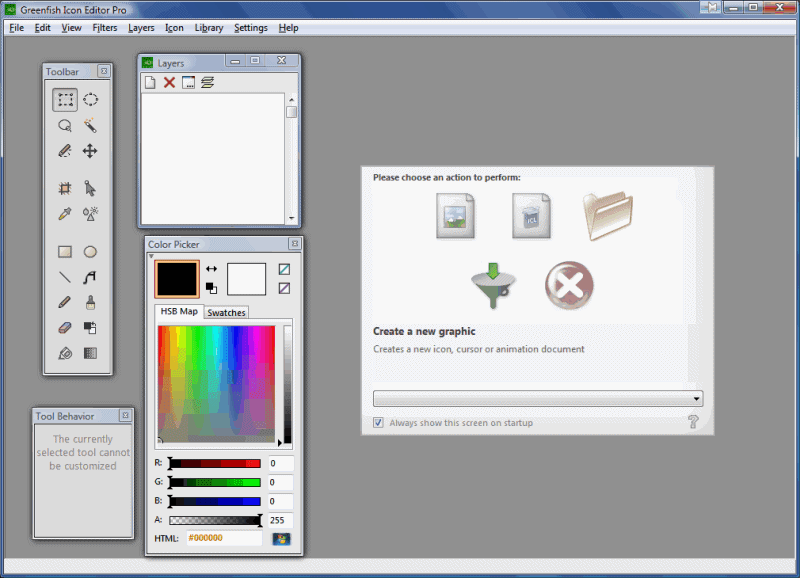 This version of RWCE contains some changes introduced in RealWorld Paint 2013.1, including redesigned color picker, drawing tools and effect windows. - When selecting cursor sizes in various places of the application, a text field with one or more sizes in pixels and a dropdown menu with standard options is used. - Improved support for Linux XCursor files. When opening a xcursor file, all resolutions are imported and the cursor can also be saved. The code was moved to a plug-in that can be installed from the online page. - Function that uploads cursor to the cursor library is now more user friendly. Users must log in before uploading a cursor. After a successful upload, a link to a web page with the cursor is displayed. Obviously flawed cursors can not be uploaded anymore. Batch Icon Extractor is a small tool for batch extraction of icons, including Windows Vista compressed icons. Icons from the file or from all files under the given folder are saved to a new folder called "icons" under the same directory as the folder/app. Also supports drag and drop a file or folder to the application icon. How to extract: Download the EXE to a folder of your choice. Launch BatchIconExtractor.exe. 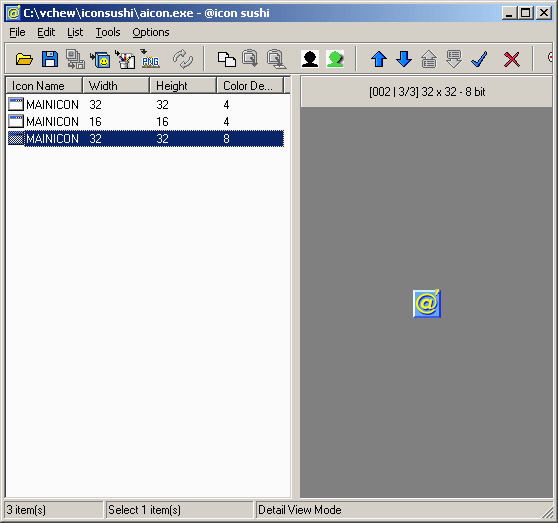 ASysIcon allows for the viewing and saving of the registered system icons. Along with the icon image, ASysIcon also displays the associated icon index within the system imagelist. ASysIcon also allows you to copy icons to the Windows® Clipboard for pasting into other applications. The icon list can also be printed. How to extract: Download the ZIP package and extract to a folder of your choice. Launch ASysIcon.exe. AniFX is an all-in-one solution for cursor creation, extraction and editing. Includes many tools and more than 40 effects. Can utilize images, export cursors to images, or import them from Windows and Mac files. Animated GIF files can be converted to cursors and vice versa. Supports transparency with XP/Vista/7 cursors and batch processing. Note: The official website is offline so we are linking to the archive.org mirror. Alternatively, AniFX Portable is also available. How to extract: Download the ZIP package and extract to a folder of your choice. Launch AniFX.exe. Website and download links seem to be broken. Thanks, Emka. The download link points to http://web.archive.org/web/20110204080136/http://icofx.ro/anifx/files/anifxpe.zip now. I've also added a mention to the PA.c version. When IcoFX went payware, cursors edition capabilities were added to it. Probably, that's the reason why AniFX was killed. ToYcon is a fast, drag-and-drop PNG to ICO convertor. Support for Vista icons with embedded PNG compression available. How to extract: Download the ZIP package and extract to a folder of your choice. Launch ToYcon.exe. Retrieved from latest Webarchive snapshot. Links to Download and to website are broken. Softpedia does not have it. IcoFX is a complete all-in-one solution for icon creation, extraction and editing. It supports transparency and has tools and more than 40 effects to create icons. It can also import and export various images formats and has batch processing capability. How to extract: Download the "portable edition" ZIP package and extract it to a folder of your choice. Launch IcoFX.exe. Dowmoad 12noon Dispay Changer (free -> google): very nice prgram, helps me a lot with old programs on my new large screen ! Install. Go to folder where installed, make a shortcut from the cd.exe folder. Go to the space and type (without quotation marks, but leaving again a space before, in between and at the end) "-width=1152 -height=864" (or any other screen size COMPATIBLE with your screen, e.g. 1600x 900 1027x768, etc; see help of dc to find out which screen sizes are compatible). Change the name and icon of dc.exe to IcoFX. The busy XP screenshot doesn't do the app justice. Worthwhile app for icon creation and extraction. Main limitation of this version is the lack of 512px+ size support, which OSX and now Windows 10 support. @icon sushi is an image-to-icon converter that supports alpha channel, transparency mask, WinXP 32-bit icons and multi-icon ICO files. It imports ICO, BMP, PNG, PSD, EXE, DLL and ICL files. It exports ICO, BMP, PNG and ICL files. Therefore now up to 256x256 of image sizes are supported. - Fixed: View size ComboBox did not work. - Fixed: Text color did not inherit windows design settings. - Fixed: In some cases, list images and large icon images were not displayed correctly. - Fixed: Error occurred when saving many icons to *.ico or *.icl file. Tried most of the icon editors listed and found that the application works in XP SP3 and Vista. I confirm that placing aicon.ini in the application folder works. The small size and with all the basic tools needed to extract, convert format and save, with a GUI that is intuitive and easy to learn how to use, means that this software is highly recommended. The download link, and the application still work fine in Windows 10.